Reptile species are in decline in the UK due mainly to the loss or fragmentation of habitat. All British reptile species are offered some legal protection. Although the level of protection varies depending on the species, all are protected against injuring, killing and selling. Only the sand lizard and smooth snake are fully protected under the Wildlife and Countryside Act 1981 (as amended). 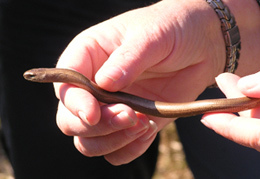 Reptiles are active during the summer months and therefore all surveys must be conducted during this time. The optimum time for reptile surveys are the months of April, May and September. There are several types of habitat that suit reptiles, these include long grass, dry heathland, hedgerows and woodland edges. To survey for reptiles artificial refugia is placed around the site in sunny places as reptiles will often use these areas to raise their body temperatures. The refugia is then systematically checked for reptile presence. Reptile solutions can include the installation exclusion fencing systems, hibernacula creation, habitat enhancements, and reptile translocation. BlueSky Ecology works closely with local company Blackdown Environmental who offer excellent rates for all types of exclusion fencing, including installation.